Astronomers think that the Universe started out as an almost homogeneous mass that spread uniformly. Small fluctuations in the initial mass distribution increased by gravity over the 13.7 billion years of the Universe's age and produced the recent array of clusters. Because clusters contain a larger number of old and massive galaxies than those found in isolated galaxies, astronomers speculate that developing clusters may significantly affect the evolution of their member galaxies. Therefore, understanding the details of cluster formation is an essential step in addressing key issues of structure formation and galaxy evolution. A necessary part of this process is an investigation of all stages of cluster formation from beginning to end, which is why the current team gave particular emphasis to studying the birth of clusters. The team chose to observe the Subaru Deep Field, a 0.25 square-degree-wide field in the northern sky near the constellation Coma Barenices. The Subaru Deep Field is one of the most suitable regions for finding protoclusters in the early Universe; the area is not only deep and wide but has been intensively observed with the Subaru Telescope, which has detected very faint galaxies. When the team searched for distant galaxies in the Subaru Deep Field and investigated their distribution, they found a region with a surface number density five times greater than the average. The astronomers then used Subaru's Faint Object Camera and Spectrograph (FOCAS) to conduct a spectroscopic observation, which confirmed that most of the galaxies located in the highly dense region lay in a narrow area in the line-of-sight. This concentration of galaxies could not be explained by chance. On the basis of their observations with the Subaru Telescope, the team confirmed the existence of a protocluster 12.72 billion years ago (Fig. 2)--the most distant protocluster found with its distance established by spectroscopic observations. The astronomers were able to directly observe this cluster of galaxies at an early stage in galaxy evolution, when structures were beginning to form in the early Universe. This discovery will be an important step on the way to understanding structure formation and galaxy evolution. Although the team also investigated the properties of the galaxies in the protocluster, they did not find a significant difference between the protocluster galaxies and other galaxies in the field. The astronomers speculate that the characteristic features of cluster galaxies in the nearby Universe occurred in later stages of cluster development, not during their birth. Close examination of the internal structure of the protocluster showed that it could consist of subgroups of galaxies, merging together to form a more massive cluster. More information: Astrophysical Journal, May 1, 2012. Although the team also investigated the properties of the galaxies in the protocluster, they did not find a significant difference between the protocluster galaxies and other galaxies in the field. Are they essentially stating these early galaxies look, pretty much, like ordinary modern galaxies? If the average star takes millions of years to form, and if the average galaxy is 100,000 light years wide, and the average separation between galaxies within a cluster is a little over an order of magnitude larger than their diameter, wouldn't it take many hundreds of millions of years for galaxy clusters to mature? 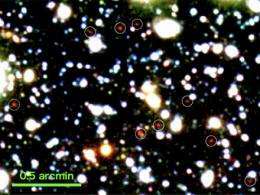 So, how can these "early" galaxies look, pretty much, like any other random galaxy? That is, shouldn't these new clusters be compact and super hot? Shouldn't they be rife new star formation, and collisions? It seems to me, something must be be wrong with our understanding of the "early universe." "Are they essentially stating these early galaxies look, pretty much, like ordinary modern galaxies?" Uh, no. From the press release and the published paper, the researchers looked at the luminosities and star formation rates of galaxies in the protocluster(@z=3.1) and field galaxies with photometric redshifts between z=(2.6-3.6). IOW, they looked at galaxy properties of members of the protocluster and compared them to other field galaxies that had similar redshifts(hence ages), and found similar properties(again, wrt luminosity and SFR) for both groups. So no, they aren't comparing members of this z=3.1 protocluster with galaxies in the present-day universe(z=0). So no, they aren't comparing members of this z=3.1 protocluster with galaxies in the present-day universe(z=0). Upon reading the paper you referenced, it appears they compared many of their findings with the Coma cluster (z = 0.026), and it appears they found a high level of correlation. As shown in the figure, it is suggested that the equivalent of 10 - 15% of the galaxies with > 10^10.5 M. in the Coma cluster is already seen in the SSA22 field. ...suggests that the number of the > 10^10.5 M. galaxies in SSA22 is equivalent to 30-40% of that in the Coma cluster. So, unless I'm missing something, it appears my first observation retains some merit. These results suggest that we are witnessing a protocluster in which the progenitors of massive galaxies are formed in the high-density region of star-forming galaxies.